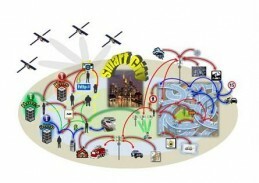 The Cocoon (Cooperative Sensor Communications) project, based on the vision of “smart” cities in which all devices within municipal areas are intelligently linked to one another, is being implemented by researchers at TU Darmstadt and the University of Kassel in Germany. The backbone of a “smart” city is a communications network consisting of sen­sors that receive streams of data, or signals, analyze them, and trans­mit them onward. In the model of the existing “Smart Home” control systems already on the market, the researchers envision avoiding traffic jams in cities by car-to-car or car-to-environment (car-to-X) communications. They also see health-service sys­tems benefiting from mobile, sensor communications whenever patients need to be kept supplied with information tailored to suit their health­care needs while underway. The researchers intend to create conditions under which sensor antennae will, in the future, behave like spotlights: once they have located a sought device, they will track it while suppressing ambient interference from stray electromag­netic radiation from other devices. The researchers regard the movement of sensors on mobile systems and their frequent entries into/exits from instrumented areas as the major hurdle to be overcome in implementing their vision of “smart” cities. The project is funded by the State of Hesse’s Offensive for Devel­op­ing Scientific-Economic Excellence.